Why not lighten a heavy workload with a workspace made to order for a modern minimalist motif? It’s the Westbrook Desk from the Inmod Signature Collection and it’s taking a break to tell you that no more does a strong work ethic have to be symbolized by a supersized desk! With its “less is more” look, the Westbrook Desk sets the stage for sleek simplicity with its clean-lined design. In your choice of bold and graphic yet easy to integrate colors, each accented with top-quality walnut, the Westbrook Desk has one drawer beneath its sharp-lined surface and four slim yet stable legs expertly lacquered for long-term durability. 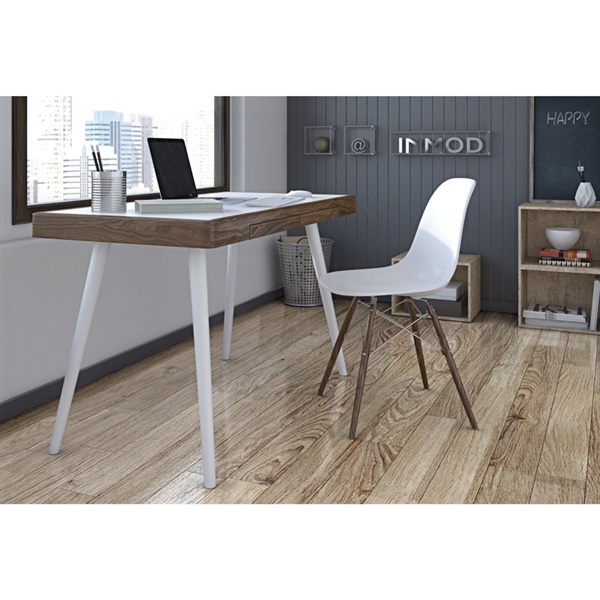 A sensible choice for a smaller space, the Westbrook Desk from the Inmod Signature Series is a stylish selection for the meticulous minimalist. My desk arrived only 2 days ago but I've truly fallen in love. Beautiful design, great quality and construction, at 1/3 the price of any other site or store. Working from home, I need a real desk but hate the bulky look of most. The Westbrook desk is streamline and sturdy. With it's bright surface and mid-century legs, it puts a smile on my face and makes me happy to get to work. I love this desk. I ordered the desk with a black surface and it looks great. I have it in my living room with modern furniture and looks beautiful. My husband did have a little difficulty putting the legs on. You have to make sure they face the right direction as they are not marked. We also had to drill a hole in the surface to put computer and desk light cords through. Drawers are small but have enough room for supplies. Desk came in a timely manner and was well packaged. Black matte lacquer completely brought my office into the 21st century, it was such a simple solution to changing the entire rooms style - i highly recommend this desk! compact and high quality - happy to own one! I wanted something simple, compact and sophisticated that was affordable, this desk is perfect! Clean lines and a smooth top, tapered legs match well with the tapered legs on most of my furniture - a well made decision! I decided to turn one of our rooms into a home office for everyone in the family, we needed to fit 3 desks in there and these work like a charm! Right size and enough space for everyone to do what they need to do comfortably. i was looking for something very simple and that would look good in a few rooms, i'm happy i went with this one - its perfect. Sleek and minimalist desk. Nothing too flashy but well-made. Perfect for my daughters room at home. She loves it! This is the perfect size desk for my home office space, Its simple but its sturdy and still has style. I wanted something that would last, very happy with my choice! The Dimensions of the Sean Dix Westbrook Desk are: Width: 49" Depth: 25" Height: 29"